Time for another challenge at Heart 2 Heart. This week, it's all about mustaches. 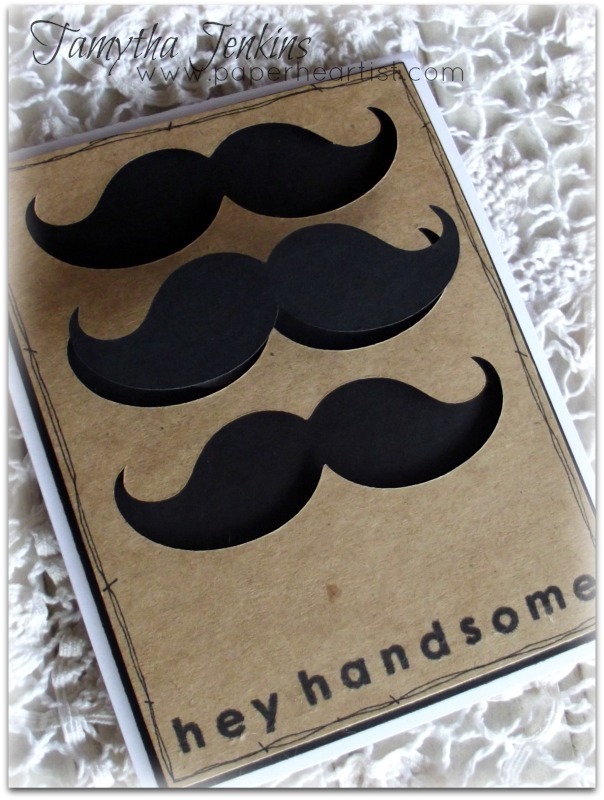 Create something that features mustaches. I don't know about you, but when I first saw that this was the challenge, I think I had a bit of a panic attack. First of all, I had no idea what to create. Second, I don't own a mustache stamp. 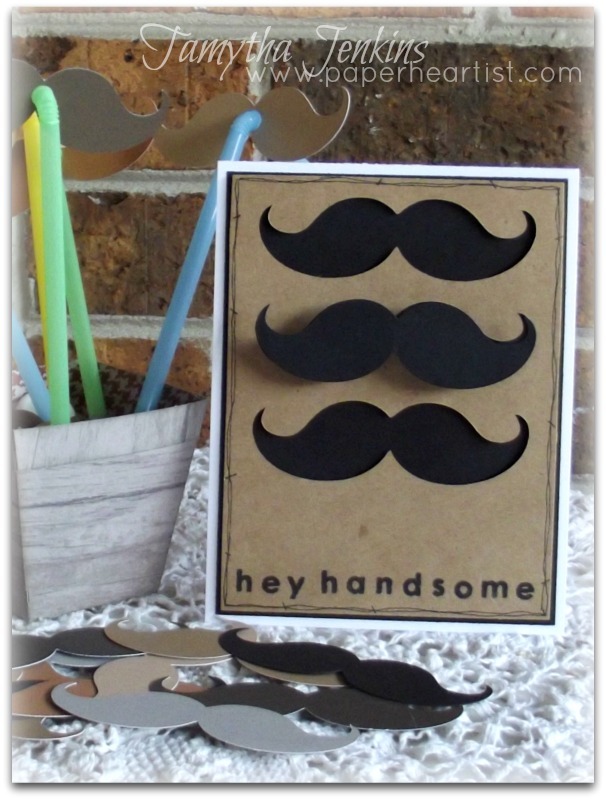 So after venting my panic with my friend, Tamra Pope, I decided that I would create something using the mustache on the Cricut Artiste cartridge by Close To My Heart. 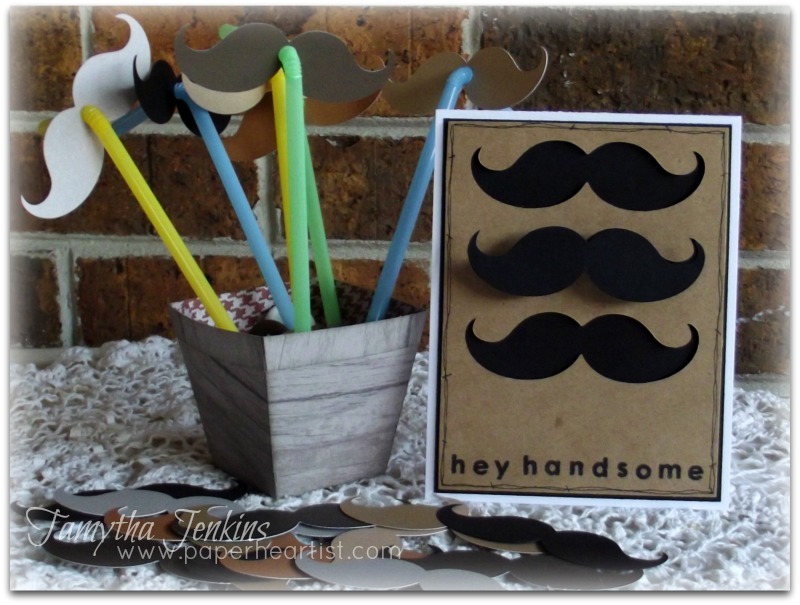 After creating the basic card, I knew that I wanted to give this card to my son, so to make it a little more fun, I added an additional mustache with a spring over the middle mustache. However, before sticking the spring down, I sponged black ink onto the white spring base and filled in where needed with a black craft pen so that it was a little more camouflaged against the black cardstock. Now, before you head off to create your own "hairy" goodness, I need to remind you of a couple of things. The first thing is about the "rules" of the Heart 2 Heart challenges. Finally, we do ask that you consider turning off word verification, as it does make it easier (and less time consuming) for the design team to leave comments, as well as visitors to your blog. ;) And personally, it usually takes me two or three tries before I get it right....frustrating for sure. The second thing that I wanted to remind you about is March Madness at H2H. We are giving away a few different prizes this month on the Heart 2 Heart Challenge blog. One for first time (non-CTMH consultant) participants and one for both the consultant and non-consultant who plays the most during the month of March. Be sure to check out this post at Heart 2 Heart to read all about the rules. In addition to prizes from Heart 2 Heart, some of the designers are offering blog candy. I gave away blog candy two weeks ago and plan to give away some more again, but for now, to find out if any other designers are offering blog candy, you will have to go check out their blogs. So get out there and create! This is so creative and fun. I am sure your son loved it. Yes, Tamytha, I was right there with you panicing! I kind of ignored this one, in fact...until that straw popped into view! ;) I am so happy to have had the challenge, now though--stretching my creativity is something that Heart 2 Heart does so well! Your idea to pop up the middle stache was awesome, and added great fun! Fabulous card Tamytha...I knew you would pull this challenge off too! I LOVE this card, so simple, but makes such a big statement! Thank you for the inspiration! Adorable card! I love the simplicity of it. The doodle lines around the edge are a great finish. Great card!!!! So nice catching up on your blog tonight. I'm always so inspired when I pay a visit! Thanks .... Hope all is well in your world these days. I really love this card...it's so CAS yet packs a punch. The dimensional mustache really adds a lot!